In a blow to young climate activists, a Seattle judge dismissed a lawsuit on Tuesday that alleged Washington state had violated children’s rights by failing to protect them from climate change. King County Superior Court Judge Michael Scott wrote that he hopes the 13 young plaintiffs, who range in age from 8 to 18, won’t be discouraged, but there is no right to a healthy environment and a stable climate system codified in the state constitution, the Associated Press reported. The road will be long. Similar to the Washington state lawsuit, Juliana argues that the federal government has created an energy system that causes climate change and therefore deprives the youth plaintiffs of their “constitutional rights to life, liberty, and property.” The US Supreme Court last month allowed Juliana to proceed by halting the Trump administration’s application for a stay. Although Aji P.‘s dismissal in Washington marked a setback for the activists, a favorable decision in Juliana has the potential for sprawling nationwide impact. Maybe youth in Australia will be so inclined in the not too distant future. There is no doubt the zealots are those that drive the man made climate theory as there is no zeal in climate change denial. Before all of us who remember – fog and smog – are dead we need to put the zeal into denying and make it easier to agree? Similarly the rich know that trickle down doesn’t work but it is quicker than the win – win trickle up methodology. Consequently working on the deduction style loopholes to slow the former and quicken the latter could do some good? ps the zealots that cause my despair are the murdochian editors and those frightened autocue readers on the morning shows. I don’t think the Thug is a zealot. This would require some sense of commitment to a position or cause. No Abbott is a deluded failure hell bent on retribution and revenge. He has no principles, no morals, no scruples. 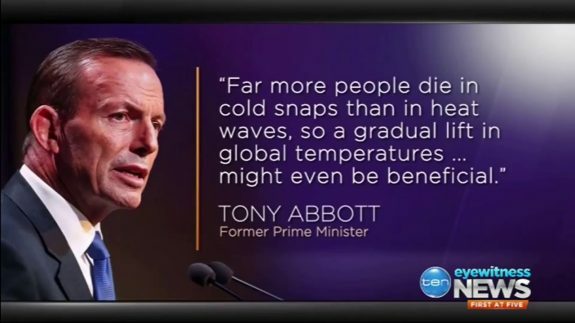 Not unlike Turnbull only dumber. Wun Farlung: There is an argument that if our business tax rate is “not competitive” businesses will relocate to places where the rate is lower. By this logic everyone should now be doing business in Mongolia, where the rate is 10%. It’s odd that political enthusiasts can be so far removed from the real world that arguments become academic musings rather than having any application or relevance to ‘the average Joe’ (or Joanne, as the case may be). Going back all those years to when little Johnnie started his dog whistling, the political aficionado’s estimated it had political worth in only a few electorates in Queensland and Western Sydney. Decades later, we are meant to believe that zealotry is the new norm and the more rabid your bark, the more popular you’ll be. We now have a multitude of choices for rabid zealots, with new parties appearing frequently. This is construed as a ‘popular’ swing to the right. Notwithstanding the amount of ‘air’ given to these nut jobs, how representative are they of ‘real people’? If you want to talk about how they are actually supported by, and representative of, ‘everyday’ people, how do you measure that? If you look at the actual membership of these wannabe political parties, they are somewhere between abysmal and negligible. The two major parties have seen their memberships reduce by half over the past decade, currently sitting around 50k. One notion has an ‘estimated’ membership of 5,000. The plethora of ultra conservative ‘parties’ on offer have miniscule memberships. As for funding, these parties are busy trying to stay solvent, becoming increasingly reliant on AEC funding and subsidy. So the question of “How much more evidence will convince the … zealots that they are wrong?” becomes one of academic pondering. We talk about these fools and their inadequacy a lot, and then wonder why ‘everyday’ people aren’t engaged in ‘politics’. Just to pose another possibility, could it be that ‘everyday people’ are very engaged, just showing it a different way? Notwithstanding the protestations of so many conservative politicians, GetUp is not a political party but a grass roots organization fueled by member’s interests in ‘social justice’ issues. They have a ‘membership’ north of 1mill everyday Aussies (and growing – even Erica Betz is a member!) and their capacity to fundraise makes the established political groups angry in their envy. Another recent phenomenon is the ‘Sleeping Giants’ group. What started as a popular movement in America targeting Breitbart has become a global activist program. The recent campaigns against Murdoch’s NewsCorpse entities have produced results, not the least of which is hilarious hysteria in his troubled empire. “True Democracy is more valuable than censorship” screamed the daily terrorgraph, in one of the most tenuous links ever attempted. A group advocates corporate entities to choose wisely where they spend their advertising dollar. Isn’t that capitalism in action? The tenuous bit is the suggestion that this is censorship. Nothing was said to SkyNews about what they say or who they promote. It merely pointed out to the corporate advertisers that they were complicit by their advertising dollar and therefore liable to be punished. Isn’t that the essence of democracy and free speech? By all means, spruik whatever garbage you like, but remember you are accountable for your garbage. How the heck is that censorship? Weren’t these ‘libertarians’ all about personal accountability? “Sleeping Giants Oz is the Aussie spin off of a US campaign that works by using social media to pressure advertisers into withdrawing support for so-called hate speech. Even the timid Aunty has had a look at this sort of activism and how the established entities are becoming more outraged because they are losing their imagined monopoly on outrage. The conversations about the imagined growth of zealotry are only of interest in an academic or abstract sense. Real people seem to have come to terms with the maxim that ‘Hell hath no fury like a zealot scorned’, showing little interest in the ensuing conflagration. The zealots seem consumed by the fact that they can no longer push about their rabid fetid ‘opinions’ with impunity. One thing about zealots – particularly religious ones – is that most know deep down what they say is untrue but are yet to admit it to themselves. Some never do, but their apparent sense of false confidence is able to convince others who are unwilling to think independently, so you can indeed fool some of the people all of the time. There’s no other explanation for Abbott’s rusted-on supporters. Logic simply doesn’t work. If you need confirmation of the generosity of wealthy employers watch the linked film below. It is 1.38 minutes but outlines clearly the most prominent case of big business generosity towards its workforce. Again, I thank you all for your thoughtful and comprehensive contributions that add so much to the dialogue evoked by this piece. I enjoyed reading them all. The suggestion that Abbott (who features so prominently in this piece) is hellbent on destruction and revenge is evidenced every time he opens his mouth; I suppose whether or not he is a zealot is an academic question. That he has no principles, morals, or scruples is not – that is self-evident. I’ll take a look at the Walmart video Kerri when I’m back on ‘unlimited usage’ in town.